Squirrel Appreciation Day is an opportunity to enjoy and appreciate your tree climbing, nut gathering neighborhood squirrels. It's held in mid-winter when food sources are scarce for squirrels and other wildlife. Sure, squirrels spent all fall gathering and "squirreling " away food. But, their supplies may not be enough. And, the variety of food is limited. So, give them an extra special treat today to supplement their winter diets. Not everyone likes squirrels. While they are fun to watch skirting around the yard and trees, they are aggressive at bird feeders. Squirrels tip almost any bird feeder and spill the seeds in search of the particular seeds they want. In the fall, they attack pumpkins on front porches in search of the seeds inside. For gardeners they dig up and steal flower bulbs, and may eat some of the veggies in your garden. When you think about it, mid winter is the best time to appreciate squirrels. In the winter they provide a little entertainment. During other times of the year, you may look at them as a pest in the flower and vegetable gardens. According to Christy Hargrove, the founder, "Celebration of the event itself is up to the individual or group -- anything from putting out extra food for the squirrels to learning something new about the species." 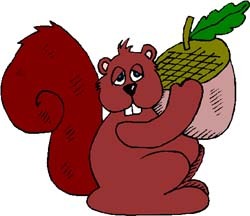 Christy Hargrove from Asheville, North Carolina started Squirrel Appreciation Day on January 21, 2001. Christy is a wildlife rehabilitator in North Carolina, and is is affiliated with the Western North Carolina Nature Center.